The School’s annual Remembrance Service had a particular poignancy today as we mark the centenary of the end of the First World War. Today we remembered those members of the School community who made the ultimate sacrifice. The giving of their todays for our tomorrows was the epitome of the School’s current motto: non nobis nati, born not for ourselves. Pupils, staff and a large number of OAs joined us for this significant anniversary. The service was held in St Albans Cathedral, when the Head of School and Headmaster both spoke. There was reflection during the selection of hymns and the School choir performed For the Fallen by Douglas Guest. 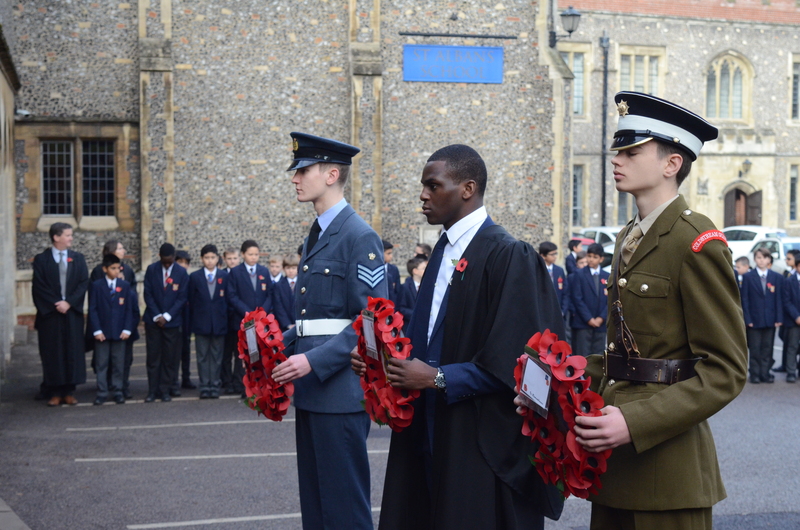 The congregation then moved to the War Memorial in the Upper Yard and Head boy, Ayo, along with Cadet Under Officer, Sam, and Flight Sergeant (RAF) Owen placed wreaths on the memorial and a minute’s silence was held. Here are some highlights from the service.